Studying the language used to describe the making and breaking of marriages grants us a unique insight into the expression of emotions such as love, joy, sorrow and loss. In the eighteenth century, couples engaging in troubled courtships drew extensively upon the language of the heart, conceptualising their hearts in particular ways according to their changing romantic misfortunes. They used terms such as ‘heart’, ‘chest’ and ‘breast’ interchangeably in their letters, while ballads even placed a lover’s heart in the breast of another. However notions of the ‘afflicted’, ‘diseased’, ‘plagued’ and ‘broken’ heart each had subtly different meanings, and were used in a particular way to denote the various stages of romantic breakdown. This began when the heart was initially cut or pierced by love, which began to pull on their heartstrings when matters took a turn for the worse. This resulted in disease or damage to the heart, which finally broke or died within them. Notably absent in their discourse were descriptions of the heart suffering on the cross, or the Catholic imagery of the heart bleeding or on fire. The symbolism of the wounded heart was shaped by competing religious and classical discourses, centring on the spear which pierced the heart of Jesus and the arrows fired by Venus’s son Cupid, which inspired love in unsuspecting individuals. 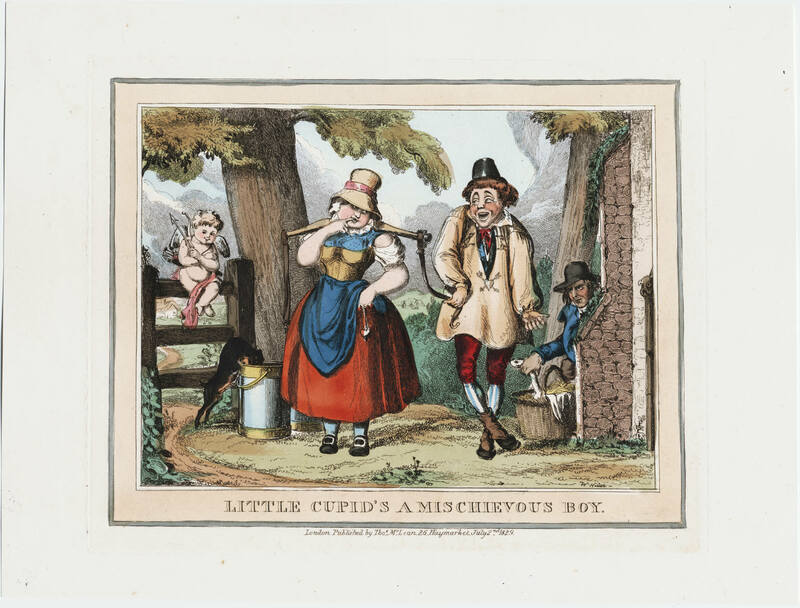 In the etching ‘Little Cupid’s a Mischievous Boy’ (1829, see below), Cupid sits on the fence holding an arrow ready to shoot at a milkmaid. She dangles her heart from a chain held in her hand, while her hapless suitor bears a heart shot through with two arrows on his shirt. This would have alerted those viewing the image that he had received the initial wound of love, while the heart she held in her hand remained vulnerable to attack. The heart wounded by arrows was granted increasing prominence in the celebration of Valentine’s Day in the 1820s and 1830s, as demonstrated by Cruikshank’s etching of the month ‘February’ in 1837 (Fig. 3.) It depicts an enraptured suitor joyfully clutching the place where an arrow shot by his beloved has entered his heart. Above him, a man with open arms waits with eager anticipation for an arrow to strike him in the chest. For lovers such as the tailor’s daughter Sarah Hurst, their failing courtships were enough to cause ‘my Heart strings to part.’ Such terminology was part of the legacy of ancient conceptions of anatomy, where the tendons or nerves were thought to brace and sustain the heart. 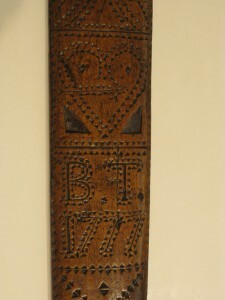 As Abraham Taylor preached in his treatise of 1730, when ‘our heartstrings break, if we rely on Christ by faith, we may have abundant support.’ The heart’s ‘strings’ were thus seen to govern the workings of the heart as an organ, holding it together and ultimately breaking when it failed. Heart-strings described in poetry were seen to throb, suffer or burst due to the high passions of love; in As you like it, a poem, addressed to a friend (1785), the muse experienced ‘Her heartstrings throbbing’ while the protagonist of Quashiba’s Return (1791) described how ‘my heartstrings were rent into twain; / And my breast did with jealousy burn’ as Quashiba had wronged him. By describing their hearts as easily (and sometimes deliberately) damaged by others, courting couples crafted the heart as a vulnerable organ which could be irreparably damaged by love. Their hearts were variously cut, stabbed, pierced, wounded, torn apart, plagued and diseased, as the damaged heart was associated with physical injury to the body as well as providing a metaphor for their misfortune. This richly detailed language was influenced by a range of sources including ballads, poems, scripture, classical mythology and contemporary prints, providing lovers with a unique vocabulary with which to understand and express their anguished emotions. 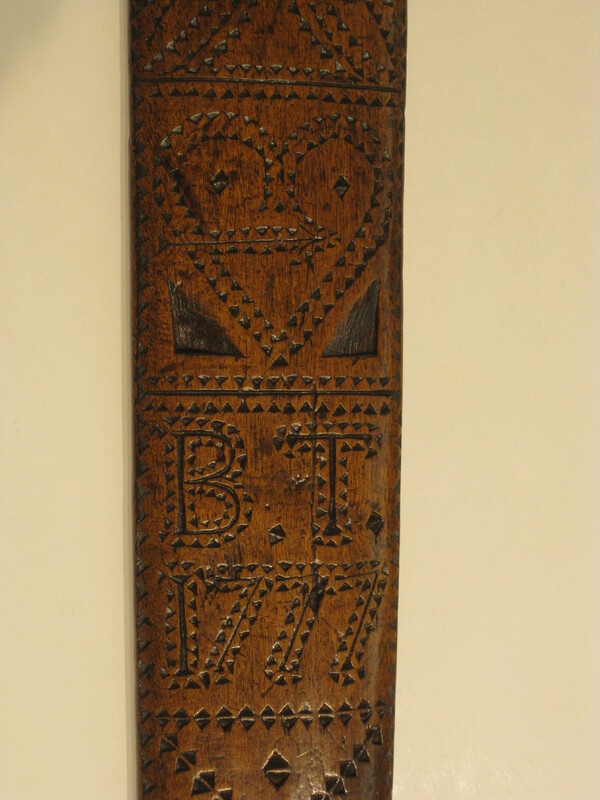 This entry was posted in Emotional Currents and tagged broken hearts, eighteenth century, emotional objects, love-sickness by Sally Holloway. Bookmark the permalink. Enjoyed this history of the broken/diseased heart. Thank you for posting. I emphatically agree and really knowledgeable article. Heart plays a pivotal role in the mentioned regard.